The town of Niagara-on-the-Lake is a pristine destination in Ontario, Canada with the Prince of Wales Hotel being one of the best places to stay while visiting this charming location. During the spring, each garden around the hotel becomes a picture of beauty as the blossoming tulips and trees decorate the grounds with their various hues. Each tulip is planted about 6 inches apart allowing the garden to receive enough sunlight to produce beautiful spring time flowers. During the daylight hours, the tulips open up their petals and allow their centers to be seen and then close up when darkness settles in around the town of Niagara on the Lake until the first light at morning. The Prince of Wales Hotel was built in 1864 and stands on a corner in the town where visitors can admire its historic architecture. The elegance of the building is stunning from the outside but once visitors enter the front doors of the hotel, the Victorian beauty and antique furnishings create an ambiance fit for a king. 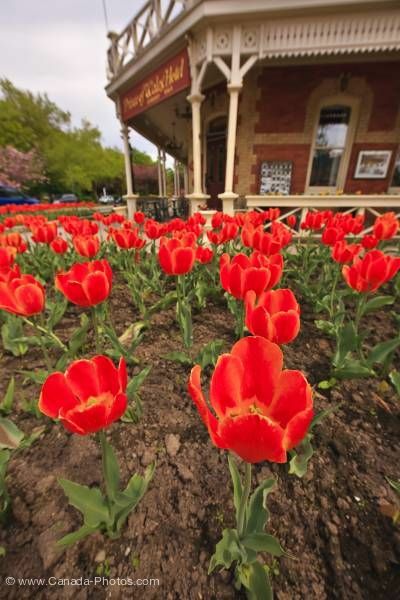 Picture of tulips blossoming in the garden outside the Prince of Wales Hotel in Niagara-on-the-Lake.